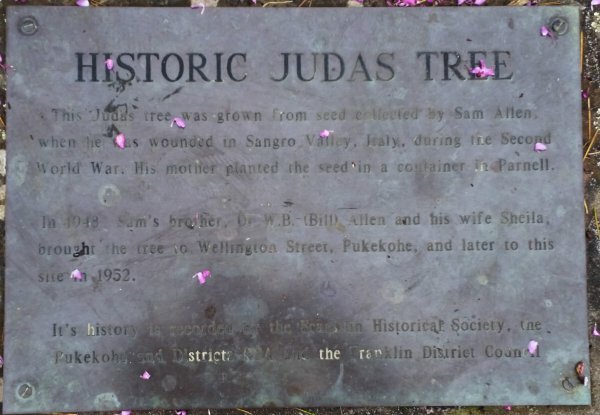 This Judas tree was grown from seed collected from the Sangro Valley in Italy, during World War II, by a New Zealand Soldier named Sam Allen. Mr Allen was wounded and took refuge beneath a Judas tree. Once he returned from World War II, the seed was given to his mother who planted it in a container in Parnell. In 1948 Sam’s brother, Dr W.B. (Bill) Allen and his wife Sheila planted the tree at their residence in Wellington Street. 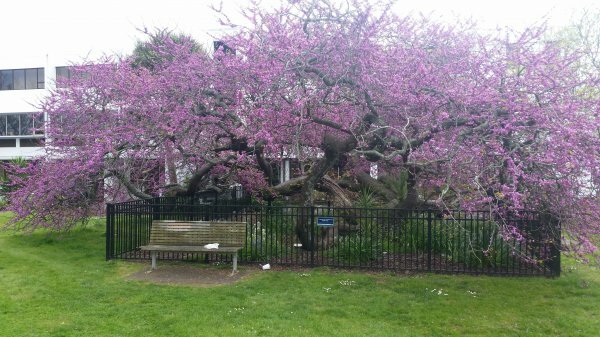 When the family moved to Seddon Street in 1952 the tree was replanted there in front of their house. This site was later sold and the land the tree was on became a park. Fortunately the council gardener at that time realised the tree’s importance. He propped up the sagging boughs which probably saved its life. 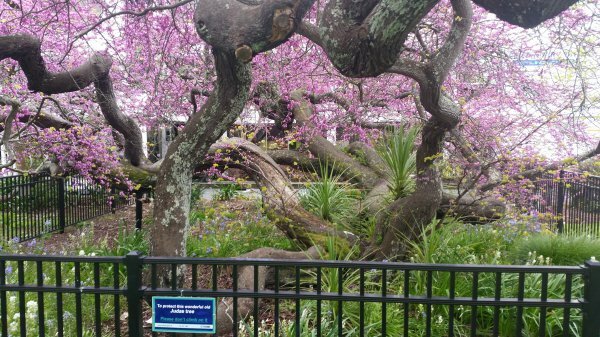 The fence was installed to protect the tree from any further damage. Elizabeth Powell (pers. comm. email 19.07.17), Council records, newspapers & information plaque. Tree branches into 4 individual trunks near ground level. 10 Oct 2015 Paul, M.T.